The Krishnamacharya parameters for sequencing vinyasa are the roots of this training. To help you to be a well-rounded practitioner or teacher, your training will also include instruction on Hatha yoga, Children’s yoga, Restorative yoga and Pre-natal yoga as well as working with seniors. You will learn how to teach asana, pranayama, mantra, mudra and meditation, as well as Davannayoga’s signature assists, and adjusts to help the student relax and take their practice deeper. You will receive an international certification for teaching yoga anywhere in the world. The popular Casa 2 opens directly onto the pool and gardens. Approximately 1,120 square feet, it has one bedroom (king and single bed), one bathroom, a dressing room, a spacious sunny living area with extra sleeping space (two single beds), and a large and well-equipped kitchen. The spacious Casa 4 is truly "the Dulce Vida." The elegant living room opens onto a huge private terrace overlooking the pool and gardens, with spectacular views of the town and bay. This approximately 3020-square-foot casa has three bedrooms and two baths. The master bedroom (king bed and one single) and second bedroom (double bed) share an en-suite bathroom. The large third bedroom has extra sleeping space (king bed and one single) and a second bathroom. There is a large fully-equipped kitchen, and the spacious dining room has seating for eight people. Step off the street into the charming Casa 7 with one bedroom (one double bed), one bath room, a fully-equipped kitchen, and an extra sleeping space in the living area (one queen-sized bed). This approximately 440-square-foot casa does not have a patio, but the pool and gardens are up one level via a small circular staircase. With its own private entrance, the bedroom may be utilized independently or as a second bedroom to any of the apartments. The bedroom, with its unique style and design, offers a cozy yet spacious place to stay. It has ocean view, Queen size bed, a balcony, bar fridge, and a Nescafe coffee maker for you coffee lovers! It is one level down from the grand living area, allowing you to easily access and utilize the pool, lounge areas, and even the extra kitchen. The bedroom is an excellent alternative to the common hotel room. The spectacular ocean and city lights view can be admired throughout this spacious room. The studio has a comfortable Queen size bed, a dining table for two, and sitting area with a smart TV, cable, and Netflix. The bathroom is constructed with beautiful natural rock and stone which compliments the natural feel of the Villa. There is a comfortable love-seat sofa with ottoman for lounging and a Bluetooth high quality sound speaker to enjoy your favorite music. Just outside is one of the common patios, offering an ideal place for outdoor lounging or perhaps to enjoy a morning coffee or tea. The fully stocked Studio kitchen has a two burner stove (gas), microwave oven, KitchenAid toaster oven, under counter fridge, quality cabinetry, coffee maker, French press, tea kettle, tea strainer, quality cook ware and dish wear, glass food storage containers, bottled drinking water dispenser at the sink, etc. Are you thinking of staying during the summer months and worried about the humidity? That's no problem as they have installed the latest technology Trane brand de-humidifier/air-conditioner with micro air filters to make your night's sleep even more comfortable. ​The studio is a perfect alternative to a hotel room or a full sized apartment. During this training, you will enjoy daily yoga classes, daily meditation sessions, mantra and mudra practices, philosophy and teaching methodology, asana and pranayama practice, and anatomy and history classes. Upon arrival, one day before the training starts, you will check in and prepare for your training. The training will start on February 9, April 1, and July 1, 2019 and will finish on February 27, April 19, and July 19, 2019. On your last day, you will relax and prepare for departure. At 06:30 or 07:15, you will have opening mantras, pranayama practice, questions from homework and walking meditations. After that, you will be practicing asana and teaching asanas, adjusting, anatomy work, or co-create and practice giving a class with your peers. Mornings may contain one to two practices in the form of classes that you give or classes that the course leader gives. Time depends on the length of the day. In the afternoon, you will have practical training in day’s coursework, anatomy, history, philosophy, teaching methodology, sequencing restorative yoga class, working with special groups, props workshops, and ended with closing mantra. From 14:00 to 19:00 will have free time. work progress. This will be only for three or four nights per week. All evenings will include self-study homework of reading or creating sequences or study of Sanskrit. There is a Kirtan mantra meditation class that you partake in. You will be getting out a bit early giving you time to rest, study, or work on the final sequence that you will lead the other student teachers in. There is time for swimming in the ocean, sunning, and rejuvenating. If there's enough time, you will be able to have a hiking trip to Las Animas Beach and a visit to an animal shelter to volunteer walking or petting. Anna Laurita has studied yoga since 1991. She has since lived in seven countries, such as in Asia, USA, and Latin America, and experimented with ways of peace and happiness found in each country. She is known for her powerful practice, intuitive understanding of the body, and her creative and engaging teaching style. Anna has led over 4,200 hours of yoga teacher training courses and has over 10,000 hours of teaching registered with the Yoga Alliance. 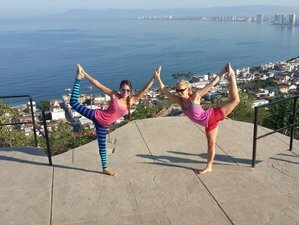 This yoga teacher training will take place at Davannayoga in Puerto Vallarta, Mexico. Casa Dulce Vida is a 2-minute walk to Davannayoga. Puerto Vallarta is a magical town that is safe, fun, and easy to get around. It is only four blocks from the beach, and the air is clean and the people are friendly. There are more and more organic stores popping up daily that offer many organic options so if you have cards for those stores they are honored here. Just a few steps away is a mom and pop style restaurant with only four tables that brings the juice or coconut water daily. They also very economical meals and snacks. They are flexible and can make almost whatever you want. Only two blocks away is a vegetarian planet restaurant with a daily buffet of vegan and vegetarian delights. There are tienditas (little stores) one block away with fresh fruit, nuts, bread, beans, veggies and fresh tortillas daily. There are numerous juice stands, fruit stands, and sandwich shops very nearby as well as a starbucks only five minutes away by foot if you need a coffee or tea and some nice air-conditioning. Good massages are available for only 250 pesos for 1 hour and 300 pesos for 75 minutes and other spa services are equally affordable and within walking distance. Please book your flight to arrive at Licenciado Gustavo Díaz Ordaz International Airport (PVR). Davannayoga is a traditional-style yoga school that offers community yoga classes and teacher training courses in Vinyasa.